Product prices and availability are accurate as of 2019-04-19 15:17:32 EDT and are subject to change. Any price and availability information displayed on http://www.amazon.com/ at the time of purchase will apply to the purchase of this product. 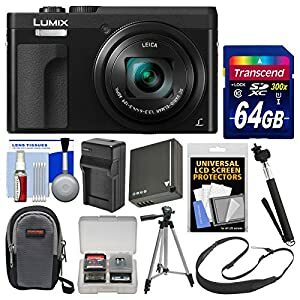 The Panasonic Lumix DC-ZS70 4K Wi-Fi Digital Camera brings the legendary optical performance of a 30x (24-720mm) LEICA DC VARIO-ELMAR Lens with amazingly stable 5-axis HYBRID O.I.S. (Optical Image Stabilizer) to a highly portable point-and-shoot travel camera. Additional features: 4K video; 4K PHOTO mode; lens-mounted control ring; electronic viewfinder; 4K Post Focus; Focus Stacking; flip-up 3.0" touch LCD; built-in Wi-Fi; plus more! Take more high-resolution pictures faster (up to 45MB/sec.) with this Transcend 64GB SecureDigital (SDXC) 300x UHS-I Class 10 Memory Card. Increase your shooting capacity with this DMW-BLG10 Lithium-ion rechargeable battery. The Precision Design PD-DC200 Digital Camera Case is a compact, lightweight and flexible way to carry your point-and-shoot camera and smartphone. Sturdy, unique fabric resists moisture and abrasion. The flexible interior divider system allows easy fit for a variety of devices, and the zippered exterior pocket provides space for batteries, cables or small personal items.